I really loved the Prima flowers in April's Label Tulip kit! They're just so pretty... they should be framed! So, I framed them... using Piggy Tale's flower press that I had(it has adhesive behind the metal part of the press).. 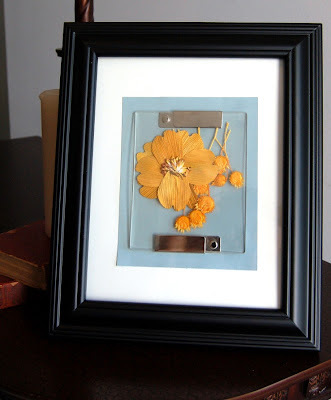 I just stuck in the Prima flowers, adhered the flower press to colored cardstock and set it in the frame! I like how it turned out! tfl! What an awesome idea, Charity! Now this is one cool idea!! wow that really looks gorgeous! Nice work!